Congratulations on your choice to travel to Sydney. Even though Sydney covers over 1100 square kilometers and is home to nearly 4 million people, transportation around the city is readily available. Automobile travel is often congested and parking is expensive, so many locals as well as tourist choose to use the state transportation system. You will find that the government ran ferry, bus and train service will take you almost anywhere you need to go in the metropolitan area. Unless you are visiting the surf beaches of Manly or Bondi located at the northern and southern extremes of Sydney Heads or friends living in the suburbs, you will find little need to travel far from the harbor or central business district, where you will find most attractions for the tourist. If you do nothing else while in Sydney, take time to visit the attractions in the central business district, The Rocks or the harbor. A visitor will find more than enough to keep them busy for a least a week in these three areas. Many attractions and points of interest around the central business district but outside of walking distance are accessible by utilizing the Monorail or City Circle Train. If visiting the harbor, ferries and buses can take you to the attractions. If looking for inexpensive ways to travel about Sydney, you will find no better way than the Sydney Pass and Explorer Busses that are government ran. Three, five and seven day passes are available and some busses are now designated as pass buses only and do not accept cash. Bus service is also available to Bondi. 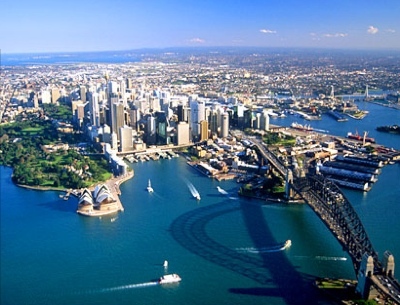 Government run ferries are also inexpensive and provide an excellent way to see the gorgeous Sydney harbor. The bus and ferry service also offers an automated search for planning extended trips around Sydney. This service is called Trip finder. Tours of the harbor are also offered by private carriers. Kingsford Smith Airport is about one half hour by taxi or one hour by bus from the city center. The airport is about 10 km from the Central Business district, near Botany Bay, in Mascot. Unless you hold an Australian passport, you must have a visa to enter the country. In Singapore or the United States, apply for your visa through the Electronic travel Authority or select travel agents to save waiting in line. Applications may be made in person at the local Australian Consulate or High Commission. The unit of money in Sydney is the Australian dollar (A$). One Aussie dollar is equivalent to 100 cents. If you need to exchange your cash for local currency, visit a local bank. Most business in Sydney accept major credit cards. Holders of Diners Card and Amex may find limited acceptance of these cards. Tips are welcome at most restaurants and at three star and above hotels. Ten to fifteen percent is normal at restaurants. Porters should be tipped A$1 to A$2 per bag. Simply round the fair up to the next dollar for taxi drivers. Many cabbies are a useful source of Sydney info.